Description: Indian Concepts is India's First Brand that Offers Corporate Kurtas for Office Wear to Indian Working Women. The Kurtas are made from Breathable and Skin Friendly Fabric, Solid Shades with Comfortable Fits and Elegant Designs. The Corporate Kurtas are available for Free Shipping in India and Shipped Globally at reasonable Costs. All the designs are available Online and can be purchased through secured Payment Gateway. Indian Concepts Corporate Kurtas are a Classy Office Wear for Indian Women all over the world. Hello Partner! Welcome to our affiliate program. We look forward to a great Mutually beneficial Association in this exciting world of Internet Marketing. Lets Grow Together. 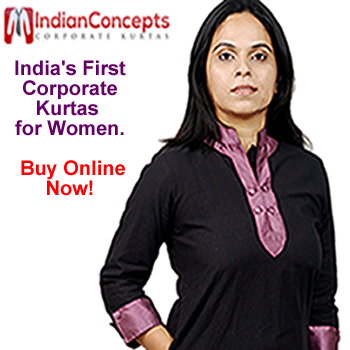 India's First Corporate Kurtas for Women. Elegant Designs, Solid Tones and Comfortbale Fits. Free Shipping in India. A Classy Office Wear For You. Buy Now! Corporate Kurtas for Office Wear by Indian Concepts. Elegant Designs, Breathable Fabric and Comfortbale Fits. Free Shipping in India. Buy Now! Elegant Corporate Kurtas for Office Wear By Indian Concepts. Delivered to UAE/ Singapore and Australia at Reasonbale Cost. Buy Online Now!